The project got its name after the islet in the middle of the Yangtze River which is on the location of the dam to the northwest of Yichang. It is the first dam on the Yangtze River and the largest hydroelectric project in China. The first-phase construction started in late 1970 and the second-phase project was completed by December 1998. The dam is 2,606 m long and 70 m high. The entire capacity is 1.58 billion cu. m. and the total installed capacity is 2. 72 million kw, with an annual output of 15.7 billion kwh. Three ship locks will be built: Nos. I and 2 locks are for 10,000-tonnage sheets and the No. 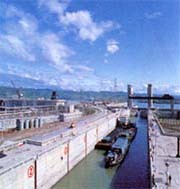 3 lock is for passenger and cargo ships with a capacity of less than 3,000 tons.